Here are some things I've decided. Please tell me if they're insane or not. Not that your opinion will sway me, but I like getting comments. OK, so here are the things I've decided. 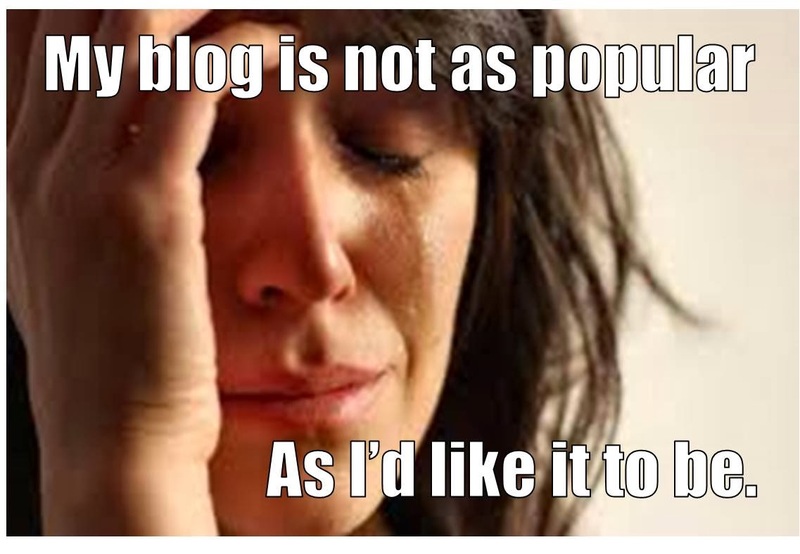 There are a lot of talented bloggers who don't get million of hits. That doesn't make them any less talented. I might actually be among them, although that's not my call. I don't make myself weaker or more vulnerable by admitting that. I have no idea which of my posts will be popular. So I'm going to stop resenting when something I think is brilliant goes unappreciated, and instead to be grateful that others see good things in my writing that I don't always see. I'm going to support the bloggers I love, even if liking their posts doesn't expose me to a huge audience. Writing makes me feel good. It makes me feel whole. Maybe huge success would make me feel even better and whole-er. But if I could choose only one goal, it would be fulfillment without success, not vice versa. After nearly 40 years of wanting to be a writer, I finally accept that there is only one definition of being a writer: A writer writes. I don't want to have a tombstone, but if I did, I want it to read: A good mom, and a good writer. Soon I will write a post listing all the bloggers I love. Most of them I consider friends first and writers second, and I've decided that's the proper order of things. Like and Share if you agree with any of this. But if you don't? I've decided that's OK, too. I don't think there has a been a post yet that I haven't liked. You have a certain panache in taking what you are writing and making it seem like you had crawled into my head and plucked out the words, putting them down on paper (or screen) in such an eloquent way that has a certain amount of balls-out brashness that is a joy to read. I can look at your writings and think, "Holy hell, I'm not alone!" I haven't known you for that long, but yours is one of the few blogs (one of only four, in fact) that I absolutely never, ever, miss reading for any reason whatsoever. Now whether it's popular or whether I am one of the three miserable clowns reading it doesn't matter a damn because I am going to keep the hell reading it, get that, woman? OK, so where was I? Yes, about the writing. You write because you have to. Any real writer knows this. I have tried to give up writing - several times. Know what? It...does...not...work. Nobody bought either of my novels? No big deal, what the hell is the internet for but to throw down the stuff for readers? Maybe some people will read it then, and you know if they read it they're doing so because they want to. In other words, from one writer to another, Prosit! I love your blog, but if I didn't I wouldn't matter. That's about all I can say, although I wonder, how do you judge success? Is it by comments? Sometimes I love the hell out of something but don't feel a response is needed. Or is it by the number of times something is shared? The fact that I typically share some of your hilarious posts with friends through a completely different e-mail address means it's probably not reflected in any statistics. And I know that sometimes my friends wouldn't know brilliant writing if it hit them in the face. I even have proof of this. I once hit a friend in the face with Virginia Woolf's "Orlando" and he didn't know it was brilliant writing. But sometimes even when the read it they don't recognize it. That reminds me of a prose poem by a 19th century French guy whose name escapes me at the moment. He wrote about offering his dog some perfume. The dog hated the perfume, but, being a dog, would eat crap. The guy said, "In this you are like the public, that must never be offered perfumes that exasperate them but only meticulously selected garbage." I'm paraphrasing from memory but hopefully you get the idea.